The Crusaders extend their record number of Super Rugby trophy wins to eight with a 25-17 victory over the Lions at Ellis Park in Johannesburg to claim their 1st title since 2008. Canterbury Crusaders captain Sam Whitelock celebrates winning the Super Rugby final against the Lions at Ellis Park in Johannesburg, South Africa, on August 5, 2017. The Kiwis won 25-17. Canterbury Crusaders captain Sam Whitelock's praised former teammate turned coach Scott Robertson after his long wait for a Super Rugby title was brought to a triumphant end on Saturday. The Crusaders extended their record number of Super Rugby trophy wins to eight with a 25-17 victory over the Lions at Ellis Park in Johannesburg to claim their first title since 2008. Having twice tasted defeat in the final in the nine years between the last two titles, All Blacks lock Whitelock admitted it was a relief to finally get over the line. "We were talking about it before the game, a number of us have been here eight or nine years and never tasted victory," the twice World Cup winner told reporters. "Out there it was awesome just to look your mate in the eye, no words needed to be spoken, the emotion came out of everyone. To have that feeling is amazing. "But the whole week has been amazing. The whole atmosphere of being here at Ellis Park, 63,000 passionate supporters getting behind their team and then afterwards they really applauded us, too. It’s something that was really special." The Crusaders led 25-3 with 15 minutes remaining against the 14-man home team, who had flanker Kwagga Smith red-carded just before halftime, but had to hold on at the end as the Lions bombarded their line with wave after wave of attack. Robertson, once a Crusaders teammate of Whitelock's but now ending his first season coaching the Super Rugby side by breaking their title drought, celebrated by breakdancing on the pitch. "My first year at the Crusaders was Razor’s (Robertson) first year as well and we used to get changed next to each other. That’s when our relationship first started," Whitelock said. "The best thing is our communication, we’re always talking. My wife is always telling me to get away from rugby for a while and Razor is always ringing me, but I’ve absolutely loved this year." 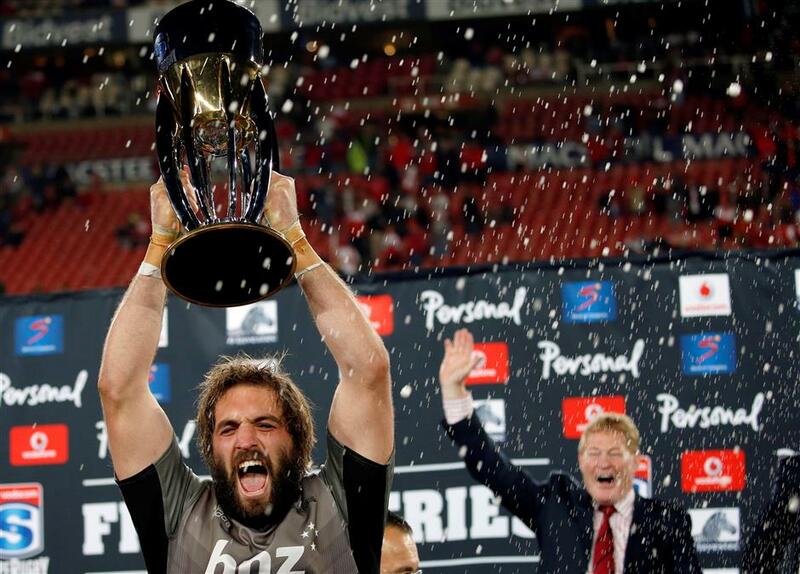 Whitelock suggested the celebrations of their latest triumph would go on for some time back in Christchurch, New Zealand. "We can't wait to get home and connect with (teammates) again and share these moments with them," he said. "It’s also going to be awesome to get back among our supporters. They’ll be really proud of what has happened."